Most books on Nazi Germany focus on the war years. Much less is known about the preceding years although these give important clues with regard to the events after November 1938, which culminated in the Holocaust. This book is based on eyewitness accounts chosen from the many memoirs that Harvard University received in 1940 after it had sent out a call to German-Jewish refugees to describe their experiences before and after 1933. These invaluable documents became part of the Harvard archives where the editors of this volume discovered them fifty years later. 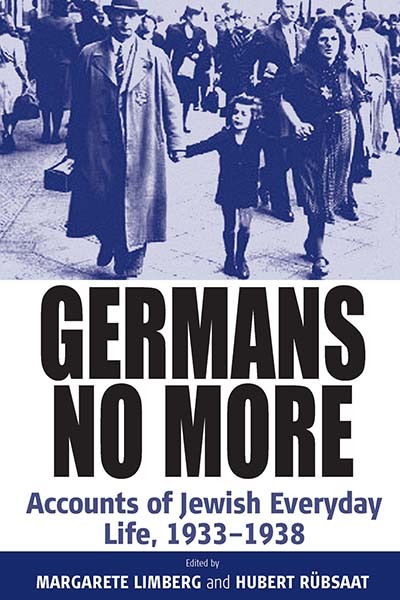 These memoirs, written so soon after the emigration when the impressions were still vivid, movingly describe the gradual deterioration of the situation of the Jews, the daily humiliations and insults they had to suffer, and their desperate attempts to leave Germany. An informative introduction puts these accounts into a wider framework. Margarete Limberg studied political science at the universities of Hamburg and Berlin. She is working as a broadcaster for German radio in Berlin. Her special areas are contemporary history and policies in the arts and education. Hubert Rübsaat studied history, sociology, philosophy, and education at the University of Cologne. He worked until 2006 as a broadcaster for North German Radio, where he headed the section on contemporary history and policies in education. He now works as a freelance journalist and publicist. Chapter 1. Boycott: Don't Buy from Jews! Chapter 6. German Culture is Verboten!